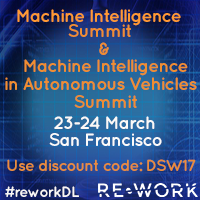 Join Ancestry, Amazon, MIT, Volkswagen Electronics Research Lab and Mercedes-Benz R&D at the Machine Intelligence Summit and Machine Intelligence in Autonomous Vehicles Summit in San Francisco, 23-24 March. It’s a unique opportunity to interact with 500+ industry leaders, influential technologists, data scientists & start-ups leading the machine intelligence and connected car revolution. View the agenda and register here. Use discount code DSW17 at checkout to save 20%.